A Russian youth group released a video seemingly showing activists projecting footage of the Moscow Victory Parade on to the walls of the White House in Washington, DC. 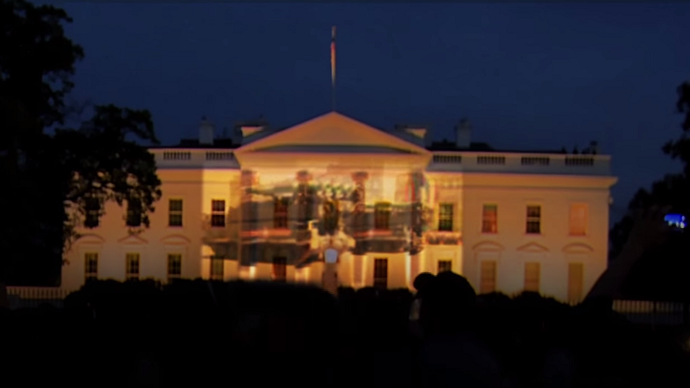 The group blasted President Obama for undermining Russia’s WWII victory celebrations. The YouTube clip, uploaded on Wednesday, seems to show World War II-era Soviet tanks and modern Russian armored vehicles rolling through Red Square – projected on to the wall of the US presidential residence by night. Some passers-by are seen taking videos of the giant projection. The video, released by students of the Russian National Cinematographic School sets out to be more than just a prank, as it starts with a message addressing US President Barack Obama. This is not the first time the student group has made their statement via cinematic work, as in March they uploaded a clip showing a projection of wall-sized lyrics of a politically-charged song on the US embassy building in Moscow. The forged clip once again highlighted that the information found online should be treated with a healthy dose of skepticism. 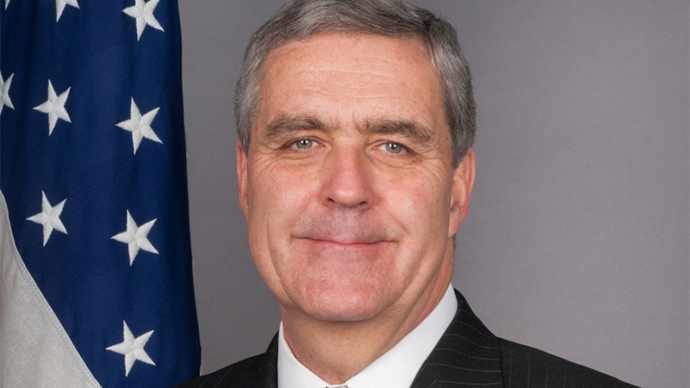 On Thursday, US Permanent Representative to NATO Douglas Lute admitted that his knowledge about the ongoing conflict in eastern Ukraine comes mostly from social networks rather than intelligence reports. “We should all ask ourselves: why is it that we know so little really about what is going on in Donbass. I mean, frankly, I read more on social media about what is going on in the Donbass than I get from formal intelligence networks. This is because the networks don’t exist today,” Lute told the Friends of Europe forum in Brussels. Emmy award-winning radio host, Lionel, told RT that social media can’t be put on the same plate as regular news and journalism. The popularity of the video by the students is no coincidence, as the rhetoric of the White House set against the backdrop of the Ukrainian crisis has irritated many young people in Russia. The unwillingness of the Obama administration to take part in the 70th anniversary Victory Day celebrations in Moscow – and particularly the centralized Western stance on it being “inappropriate” to send delegations to a military parade amid conflict in eastern Ukraine – has even been taken by some as an insult to the nation. While Victory Day has for years been the most important holiday for the Russians as a time of unity and memory, the 70th anniversary is a particularly poignant milestone. Many believe it is the last major celebration when living veterans of the war could be honored on a national level, with fewer of them left each year. The traditional military parade on Red Square has been planned to include an unprecedented number of troops and military hardware for the ‘round’ date. Recently, when German Chancellor Angela Merkel announced she would not attend the Moscow parade, a Russian doctor from Novokuznetsk proposed to launch a ‘polite’ flashmob by sending Victory Day greeting cards to Merkel’s administration address. The Facebook post went viral, and the idea was taken up by activists and media outlets nationwide. Merkel, meanwhile, said she will be going to Moscow to honor WWII veterans and victims the day after the parade, on May 10.